Did You Get an Email About Your Account Lapsing? Don't Panic! As a reminder, if you are experiencing trouble accessing a Library resource, please let us know! Sometimes we don't know there is a problem unless you report it. For help or more information, contact the Library at (515) 271-1537 or library@dmu.edu. We can assist with basic troubleshooting and verify whether or not there are any known issues with the resource you are trying to access. The Library is located on the second floor of the SEC (Student Education Center). Help is available in person between Monday-Friday 8:00 - 4:30 PM. 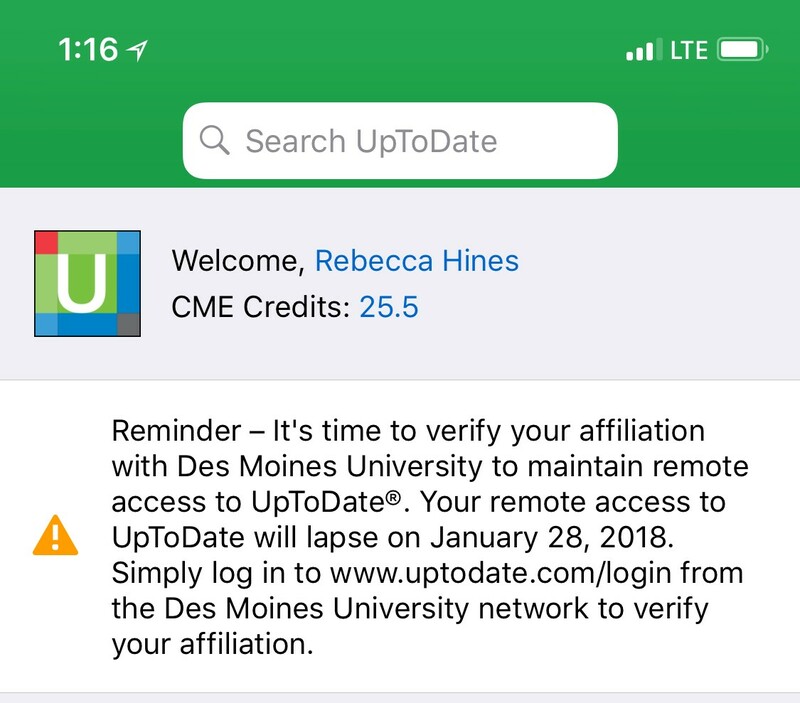 UptoDate may occasionally send you an email requesting that you verify your DMU affiliation. Or, as an app user you may see a message in the app as well. 1, Access the web version of UptoDate using the links provided by the library. Links to UptoDate are on the library pulse page as well as this libguide. As long as you can access a web browser from your phone you can do this from your mobile device. 2. Log into your personal account with UptoDate (not your DMU credentials - what username/password did you originally select?). After you log into your personal account from the website, the app should refresh itself immediately. Please note: If you already have an existing account, do not register again if you can't remember your credentials. If you have forgotten your username or password, contact UpToDate support (800) 998 - 6374 OR customerservice@uptodate.com. Registering again will give you two accounts and this will mostly likely cause a problem. Are you having trouble logging into the app, even though you followed the directions on this guide? Try deleting the app and the logging in again.